Time is running out for Matt Murdock, and it’s also running out for Charles Soule. With Daredevil 612, the writer has reached the end of his five-year run. The final storyline Soule began, The Death of Daredevil, has been a roller coaster so far. Soule has introduced a new villain, featured Matt making some real life-changing decisions, and even had Elektra coming back into Matt’s life for a simple goodbye. With artist Phil Noto and letterer Clayton Cowles, Soule returns for one last round with the Devil of Hell’s Kitchen in an extra-sized issue, and says one hell of a farewell. Saved from death and torture at the hands of Bullseye last issue by his estranged and recently created brother Mike, Matt Murdock is injured but not out. Daredevil is able to find the evidence needed to prove that Wilson Fisk has rigged the New York City mayoral election in his favor, and makes sure Fisk goes to trial. However, Matt isn’t out of the woods yet. The Kingpin’s newest henchman, The Vigil, is still at large. In his sights now? Daredevil himself. 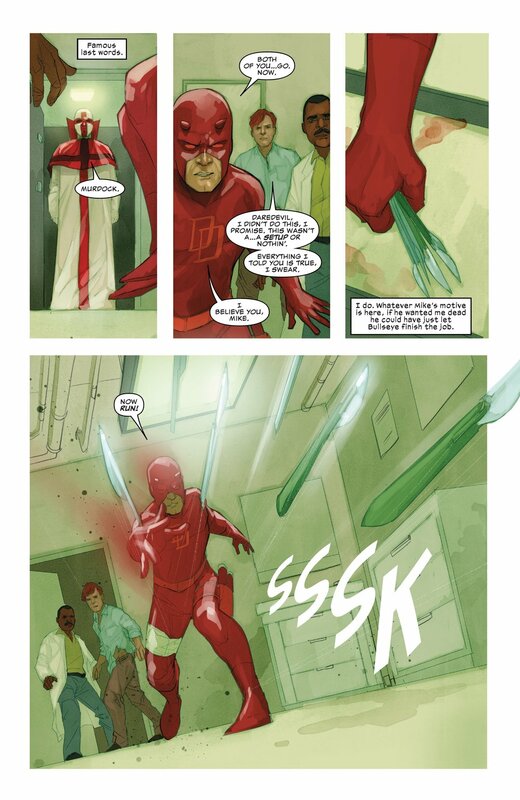 Charles Soule is easily going out on top, with some of the more interesting tales Daredevil has ever had. While not as epic in scale as Mayor Murdock’s city-wide ninja infestation, The Death of Daredevil has explored exactly how far Matt is willing to go when his opponent basically is the law. Even with his final issue, Soule has planted the idea of the Black Clinic, another off the books clinic for those who have money to pay, like Night Nurse from Doctor Strange’s The Oath. Soule has planted several clues throughout the story as to what is going to happen by the end, but most readers will have overlooked those hints. After reading this issue, you’ll want to pour over the last three issues to see if you could have caught them as well. Congratulations on a great run, sir, and a fantastic final storyline. Once more, Phil Noto has done an incredible job on the artwork. As with the last several issues, there’s a delightful color blur instead of motion lines. It gives the comic the feeling of being photographs of a stylized world, and one that relays motion fantastically. The fights between Daredevil and The Vigil are also fantastic, using several large splash pages and jumbled panels to relay action very well. The final 10 pages are just plain magical in their simplicity, and work incredibly well with Soule’s writing. While far from the best issue to jump into Daredevil’s story, Soule has crafted a strong end to a very enjoyable story. While the deck may have been cleared for the next writer, Chip Zdarsky, to take the story wherever he pleases, Soule has also left several new toys in the toybox for Chip to play with when he takes the helm for Daredevil in the coming months. Go back through your local comic shop’s back issue bins (or grab some back-issues from Comixology) and dig up the start of this storyline if you’ve not read the opening issues yet. You won’t be disappointed.